Researchers in the FAMER Laboratory address objectives spanning biological oceanography, fisheries dynamics and physiological ecology. Our work is principally concerned with marine and estuarine systems, and is led by Professor Iain Suthers. The FAMER team currently consists of 3 post-docs, 7 PhD students and 3 honours students. 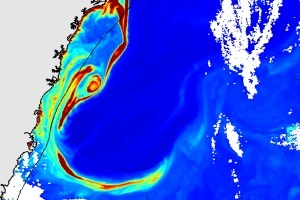 We are interested in the role that oceanographic features, such as boundary currents, eddies and upwelling events, have on the distribution and production of zooplankton and larval fish. We employ a variety of techniques including CTD profiles, mid-water trawls, plankton nets, in-situ and lab-based Optical Plankton Counters, and gliders. With our collaborators we are working in waters from Queensland right down to Antarctica. The ecosystem demand by predatory fish is not understood, because it fails to include the considerable impact of juvenile fish, especially when they reside in an estuary. 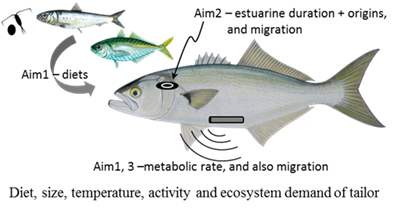 This project aims to determine the diet, and the size- and temperature-dependent growth and biogenetics of a species, from juvenile to adult; from estuary to the open sea. 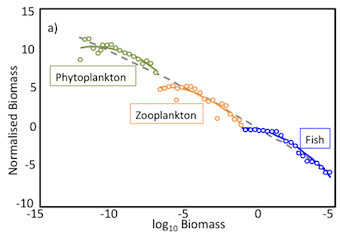 This study is also significant for fisheries management of economically important baitfish, by incorporating the size-based metabolism of a representative predator. The project is innovative by implanting acoustic transmitters, calibrated in a flume, to discover bioenergetic rates in the field. The outcomes include an ecosystem synthesis of related pelagic fish predators from catchment to coast. Small pelagic fish have great economic potential but they also sustain larger, more valuable species. The consumption by a recreationally important species will be estimated, from juvenile to adult and from estuary to the open coast. Juveniles of this representative fish can be reliably sampled, to discover the ecological requirements during the first year. This research will reveal the lifetime schedule of energetic needs, providing a novel basis for managing estuarine and coastal fisheries. 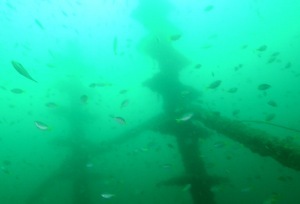 Fisheries enhancement tools such as artificial reefs and fish stocking are becoming increasingly important for the management of coastal fisheries. Our research aims to provide a sound ecological basis for these tools, and to optimise their environmental benefits. We integrate individual, population and ecosystem processes, by incorporating stable isotope analysis and dietary studies, bioenergetics, and population and ecosystem modelling.